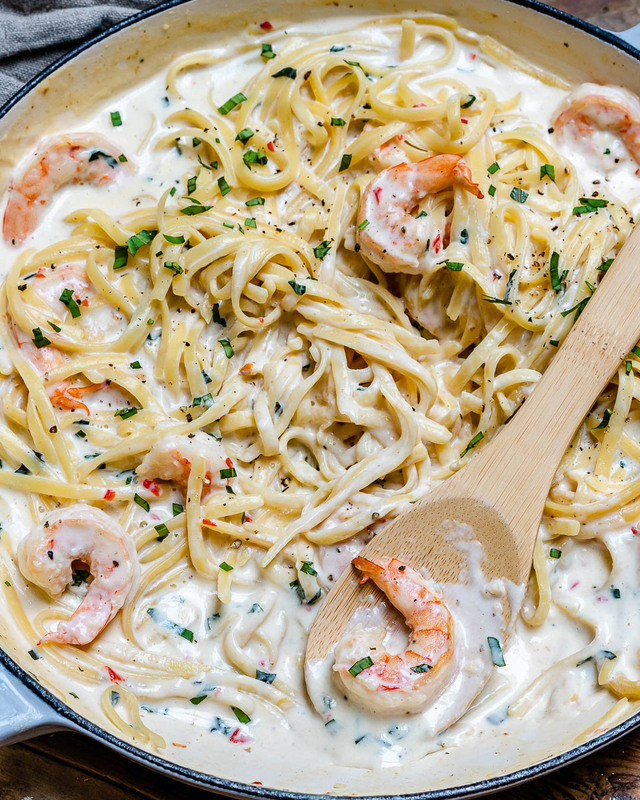 Believe it or not, this creamy shrimp alfredo pasta recipe takes just 20 minutes to make. 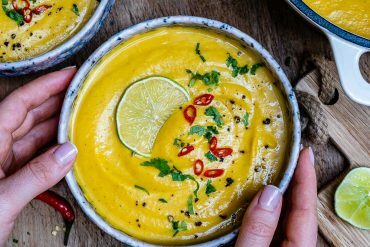 It’s quick, easy and super tasty! 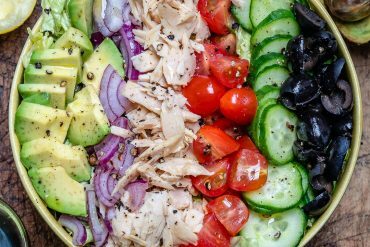 A foodie’s dream. Today I’ll show you how to make a creamy shrimp alfredo pasta recipe in just 20 minutes. I mean, how great does that sound, right? 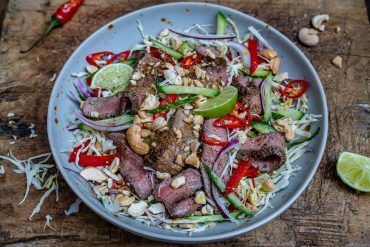 Making a super tasty lunch or dinner for the whole family in just 20 minutes… that’s gotta be any foodie’s dream. 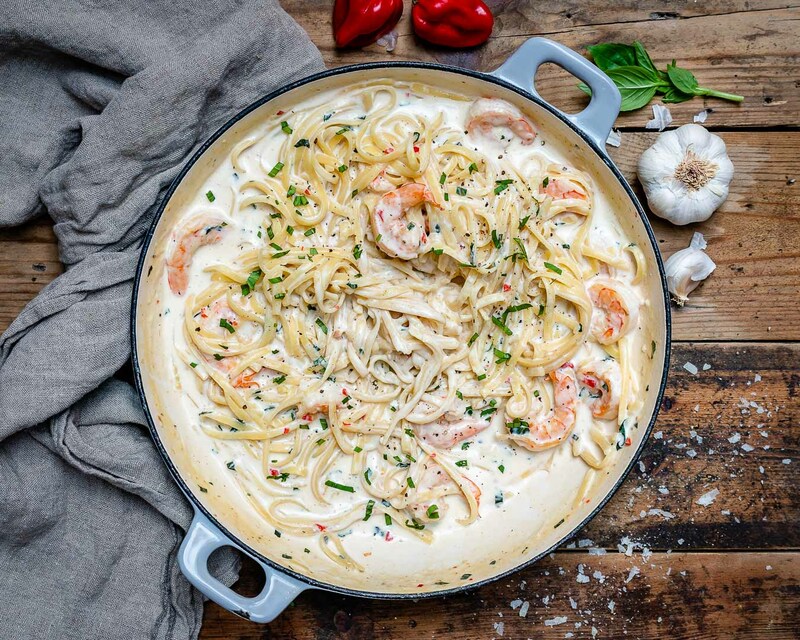 I made this quick and easy shrimp alfredo pasta in just one pot and that cuts down the much-hated dishwashing time :). So it’s not just tasty but also practical. 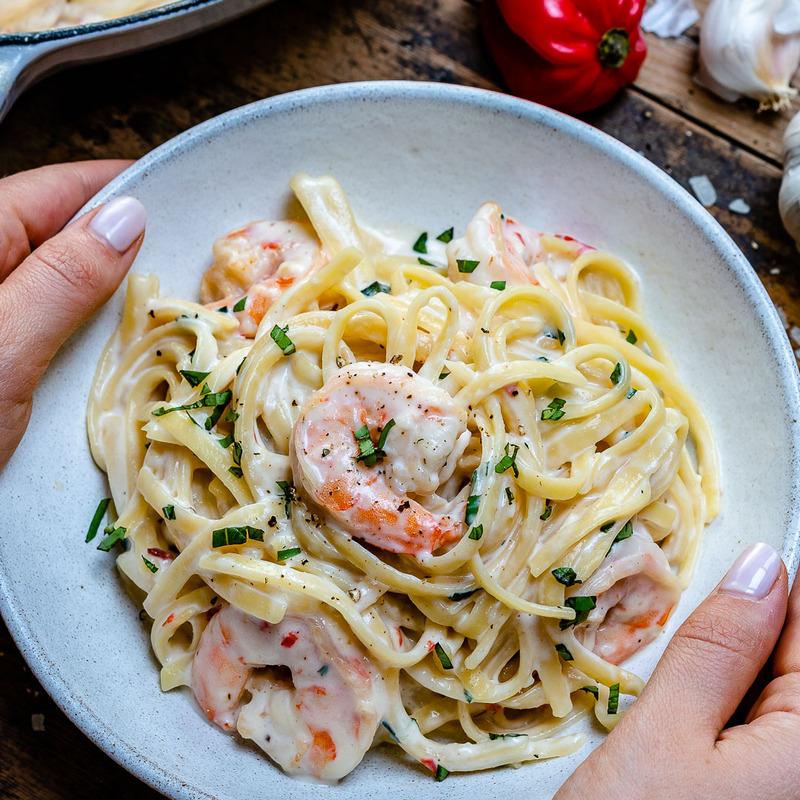 But even though it’s quick and easy, there are a few tricks you need to know if you want to make the best shrimp alfredo pasta recipe. They are very helpful, especially if you want to make alfredo sauce with fewer calories. 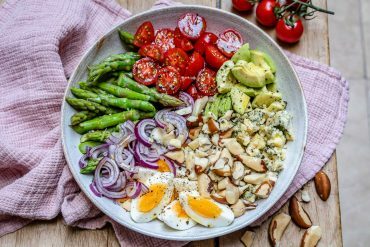 Don’t worry it’s nothing complicated and trust me, your waistline will be forever thankful. 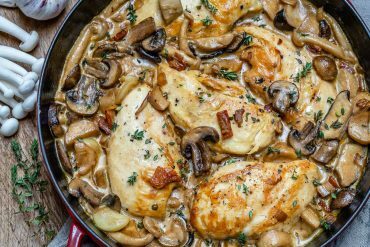 Moreover, even though one-pot recipes are quick, they require a bit more attention than regular ones. 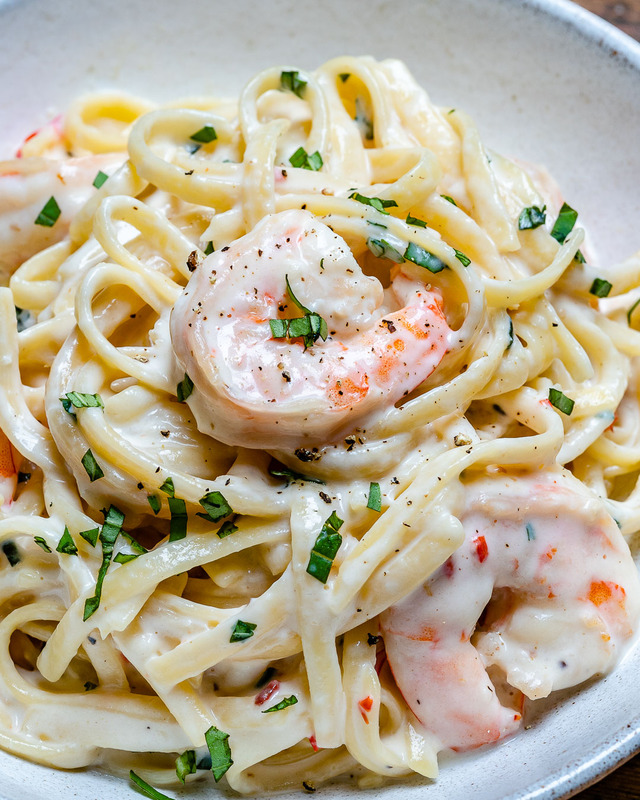 So heed the yummy tips & tricks below, and you’ll surely make the best shrimp alfredo pasta recipe! Alfredo sauce is usually made with double cream or whipping cream. That makes it rich, but also high in calories. So instead, I made it with milk. The taste difference is minimal, but the calorie content difference is huge. 100ml whole milk has 65Kcal, while the same amount of double cream is over 460Kcal. Don’t get me wrong, I am not saying there’s anything wrong with using double cream or whipping cream, especially if you don’t mind the extra calories. But I know many foodies, myself included, always try to cut down unnecessary calories just so they can enjoy more food 🙂 (or if they’re on diet, of course). For them, this tip will be very useful. Now let’s move on and see how to cook pasta in alfredo sauce and make it creamy. 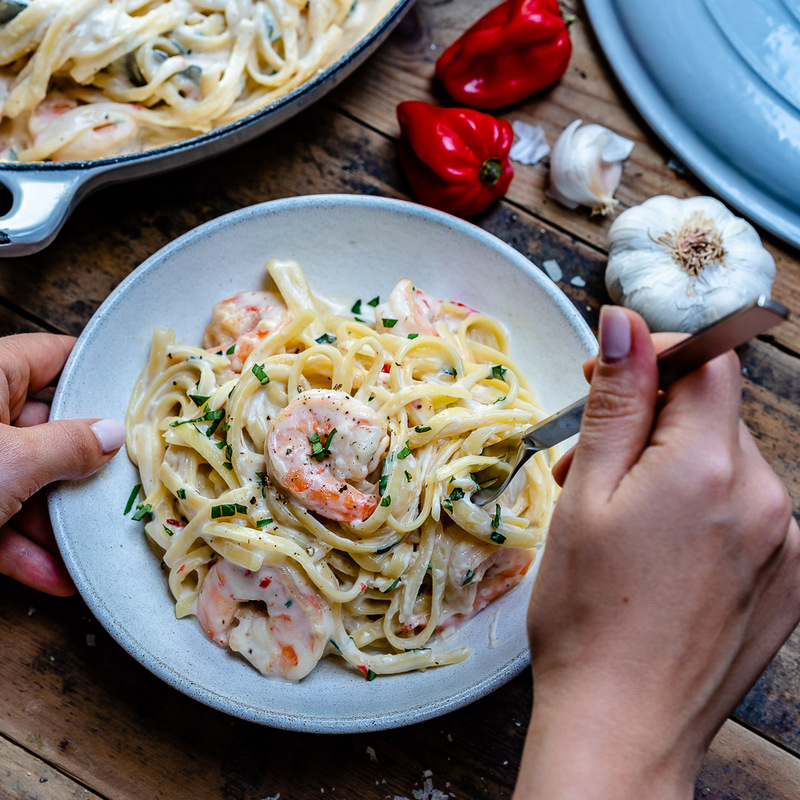 Having fewer calories is certainly a good thing but I believe the most important feature of this spicy shrimp alfredo pasta (oh yeah, I made it spicy too) is its creaminess! But to make it creamy, you need to pay special attention to how you cook the pasta in alfredo sauce. So let me explain to you how to do it step by step. First, you need to pour the milk into the pan, lower the heat right after, and then bring it to a gentle simmer. Once you see it bubbling, add the pasta in. It’s worth noting here that if you boil the milk too fast, it will curdle. The second most important step is that you need to give it a good stir, right after adding the pasta. Then, you should keep stirring occasionally throughout the whole cooking process. Otherwise, pasta will get easily stuck to the bottom of the pan and it will get burned. That would taint all the flavor of our creamy shrimp alfredo pasta recipe and we really don’t want that, do we? Another thing to bear in mind is that the Alfredo sauce will continue to thicken if not served immediately because the pasta will keep absorbing it while it’s hot. 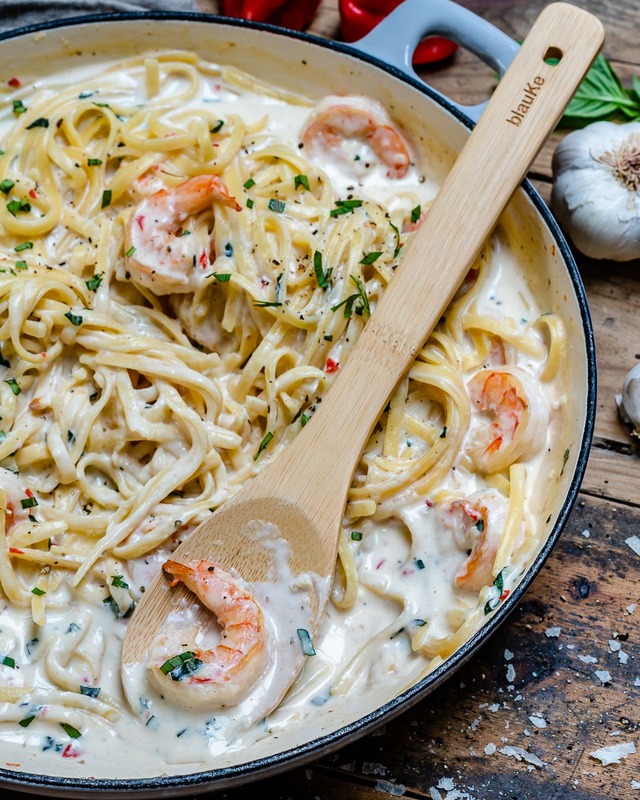 So I recommend serving this creamy shrimp alfredo pasta right away for best taste, flavor and texture. 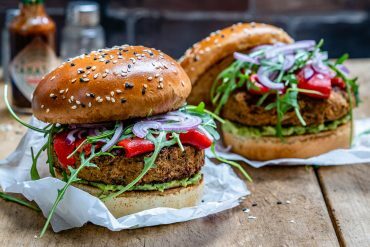 But if you have any leftovers, you can store it in the fridge for up to 2 days. It will still be tasty (according to hubby) but not as creamy. Now that you know how to make light and creamy shrimp alfredo pasta, let’s see which pasta is best with alfredo sauce. 3. Which is the best pasta for alfredo sauce? 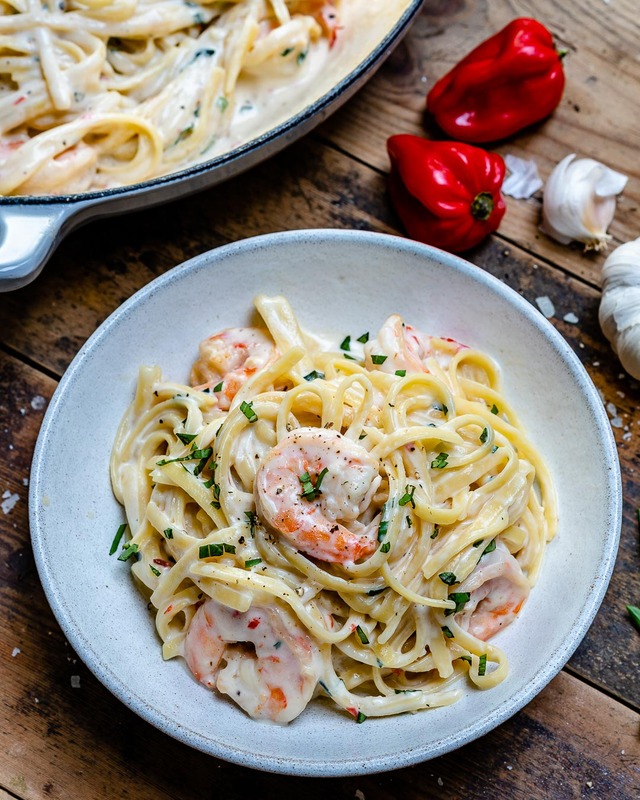 This creamy shrimp alfredo pasta recipe is made with linguine which is one of my favorite kinds of pasta. 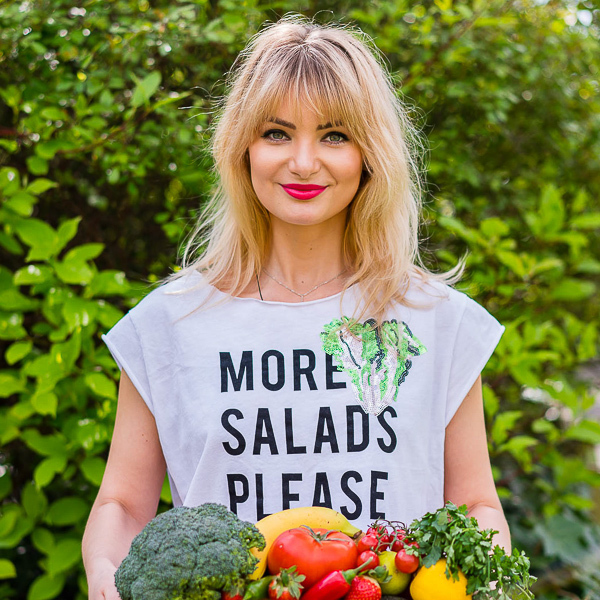 But you can also make it with spaghetti, fettuccine or tagliatelle. These types are kind of similar to linguine and because of that, cooking time will remain the same. It’s worth noting here that if you change the pasta you will need to pay closer attention to the alfredo sauce. Usually, you need about 6 cups of milk for 450g / 1lb of linguine. If you change the linguine with some other kind of pasta, you can start with the 6 cups and keep an eye on the pot to see if or when it needs more liquid. So basically any type of pasta is good with alfredo sauce, it’s all comes down to your preference. But the absorption and cooking time can vary, so you need to keep that in mind. And now, let me tell you a few simple but game-changing tweaks. 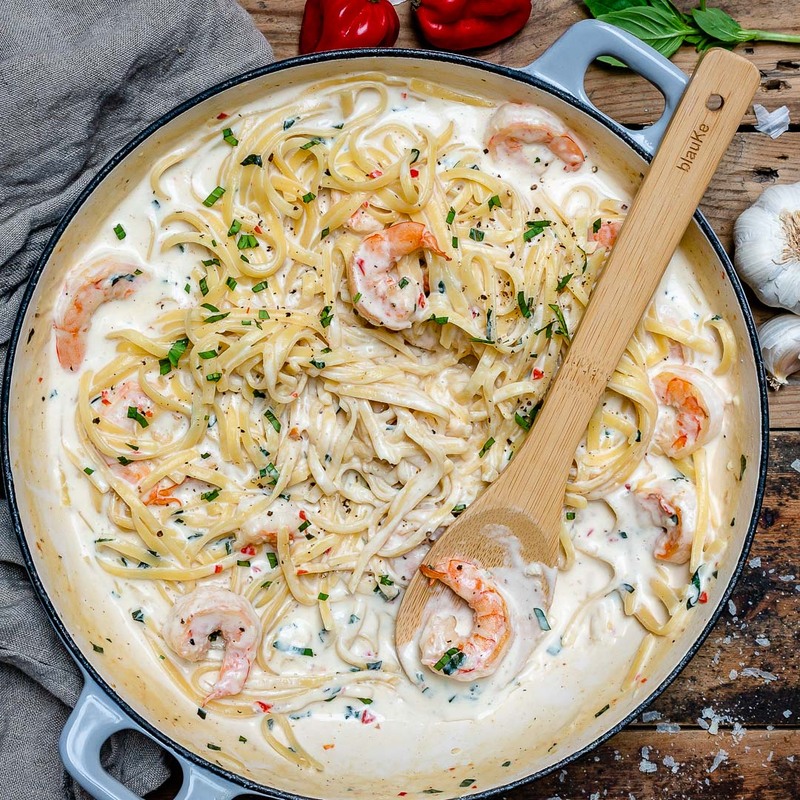 Everybody loves creamy shrimp alfredo pasta and I believe it is a recipe that you just can’t go wrong with. But what if shrimps are not really your thing or maybe one of your guests/family has some sort of allergy to seafood. Or maybe they are just not handy at the moment. What can you do then? Well, it’s simple. Just remove them entirely and you will make a delicious vegetarian alfredo pasta. Or, you can replace the shrimps with chicken, one of the most popular ingredients in any cuisine. You’ll just have to cut it into bite-sized pieces and sautee them for about 6-7min until it gets golden-brown and cooked through. Everything else stays the same. Moreover, you can also adjust the spiciness level to your taste. 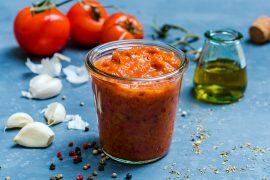 I used Habanero because I really like spicy dishes but you can replace that with red chili or chili flakes. That will make it milder. 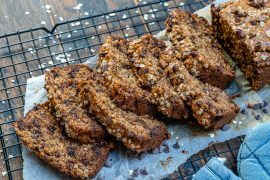 I hope I didn’t keep you too long with my tips and tricks but as you know, I like giving as many details as possible about my recipes. 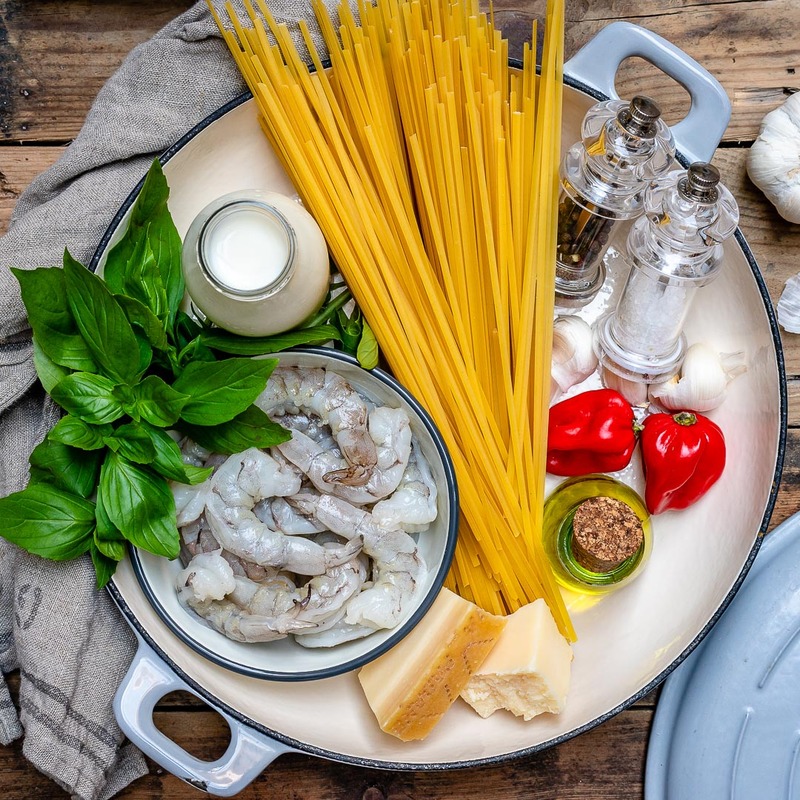 Now you certainly know how to make shrimp alfredo pasta easy, so it’s time for the best part, the actual recipe and cooking. If you make it, snap a shot and post it on Insta with hashtag #blondelish and tag @theblondelish. I’m so curious to see how you cook. And if you like this quick and easy shrimp alfredo pasta recipe video and want to see more like it, please Subscribe to my YouTube Channel. This quick and easy shrimp alfredo pasta recipe takes just 20 minutes to make. It's super tasty and perfect for sharing. Add garlic and chili, and sautee for about 1 minute, until just fragrant. Stir in the shrimps and cook until pink, about 3-4 minutes. Season with salt and pepper (to taste), then remove from the pan and set aside. Pour the milk in, reduce the heat and bring it to a gentle simmer. Season generously with salt and pepper. Stir in the pasta and cook (on low heat), while stirring occasionally, until it gets to al dente (about 7-9 minutes). At this point, you can place the lid on, but remember to give it a stir every 2-3 minutes. Return the shrimps to the pan and sprinkle with Parmesan cheese, then mix to combine. (If the pasta is a bit too dry you can add 1/2-1 cup of milk and mix well to combine). 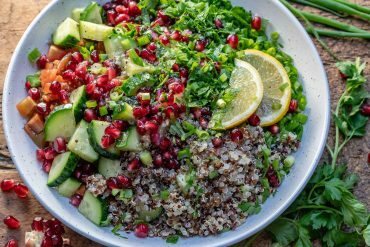 Serve immediately with fresh ground pepper and chopped basil. If you want to make this easy shrimp alfredo pasta with fewer calories, use milk instead of double or whipping cream. To make it creamy, you should simmer the milk gently. Once it starts boiling, add the pasta and give it a good stir. Then keep stirring occasionally, throughout the cooking process. It's best to serve this creamy shrimp alfredo pasta right away, but you can also keep it in the fridge for up to 2 days. However, it will lose it's creaminess because the pasta will keep absorbing the sauce. Best pasta for alfredo sauce: linguine, spaghetti, fettuccine or tagliatelle. You can remove the shrimps and you will make a delicious vegetarian alfredo pasta. Or, you can change them with chicken.